AC-SE8MP The sE8 - small in stature, huge in sound. 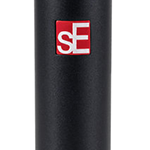 Fit for any challenges in the studio or on stage, the sE8 is a brand new high-performance handcrafted small-diaphragm condenser, fresh from the labs at sE. 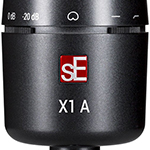 AC-SEX1A sE Electronics X1A Condensor Microphone. From high quality vocals to instrument sounds the X1A mic offers top class sound and build quality at an affordable price. 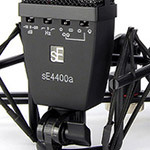 AC-SEX1SSTUBUN The sE Electronics X1 S Studio Bundle offers everything that you need to transform any un-treated room into a recording booth. 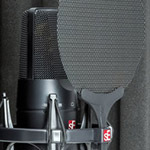 Supplied with the X1 S condenser microphone, high-quality shock mount, pop filter and the sE Electronics RF-X Relfection Filter. An incredible bundle at an affordable price, that delivers outstanding results. AC-SE4400AMP The 4400a is vintage versatility at its finest. Four polar patterns, a vintage-style brass capsule, two bass cuts and two pads, and the most adaptable shockmount around - the 4400a is pure modern classic. 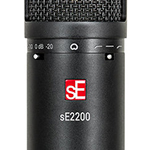 AC-SE2200 The sE2200 is the latest version of the award-winning cardioid condenser microphone that put sE Electronics on the map many years ago with its smooth, polished sound for vocals, voiceovers, and numerous instrumental applications. 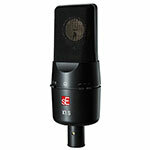 AC-X1S The sE X1S condenser microphone is a premium quality large diagphram mic. Its dynamic range and SPl handling makes it ideal for use in many situations from studio vocals through to use with live instruments.